In conjunction with Portland Photo Month, guest curators Anna Daedalus and Kerry Davis bring together five Portland artists working with alternative photography. The artists’ conceptual approaches stretch and warp the medium to treat such concerns as human perception as it relates to objects, marking time and space, the use of light to extend expressions, post-colonialism, and the impact of lens-based media on society. 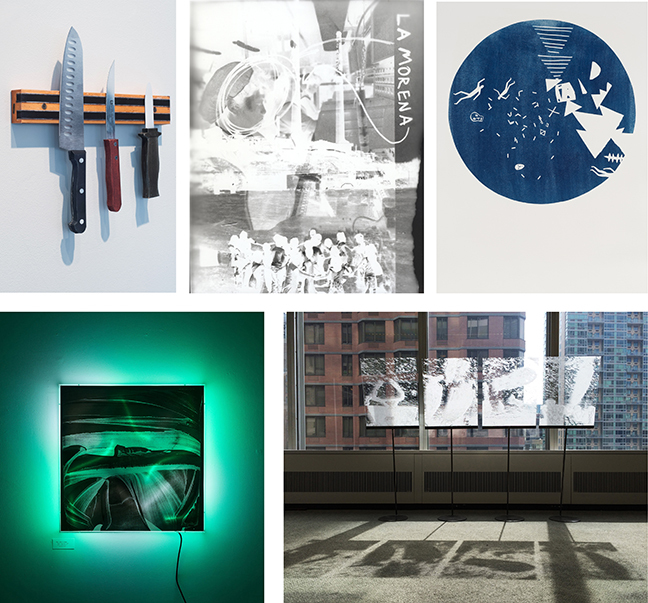 Above: Galluci, Chinese Knife Set, Cut, folded and glued archival digital prints,11.5″ x 12″ x 1“, Perez-Tlatenchi, La morena, Contact print on photo paper, 8″x10″, Heit, Blazar 3, Cyanotype, 20″ x 18”, Innis, Yet Untitled, Photographic Light Box, 31″ x 31.5″ x 4.25″, Fisher, Untitled (representations of pictographs from Agapage), Acrylic and Steel, 4 x 49” x 18” x 9”.